Does your face frown when you think of travelling with your little one? Here are some tips in planning and preparation, which can turn you and your baby into a jet-setter. Bon voyage! • Take the right mode of travel for reaching the destination. • Booking your flight during your baby's nap time can make for an easier trip. Try to get a window seat, so you will have the privacy for feeding when you need to. • Make sure you carry enough diapers, clothes, and baby wipes with you. You don't want to be running short of them if your flight/train is delayed! • Make sure the diapers are easily accessible. . Keep a few diapers handy in your carry bag if you wish. • Feed the baby before you leave from home. Hungry babies tend to be fussier during the journey. • Avoid packing too many toys for your baby. A few favorite toys of theirs would keep them occupied during the journey. • Make sure you and your baby are comfortably dressed. • Avoid travelling if your baby is not doing well for the day. • Make your travelling experience better by limiting the number of items you carry which can be done by well planned packing. • If you are planning your journey by car, make sure you plan your journey with plenty of stops for feeding and nappy changes. Give your baby a brief walk, or relief from being in the baby seat. • Use a baby carrier and a backpack to limit how much you need to carry by hand. This will make it much easier for you to relax and get comfortable during your travel. • Carry a first aid kit and medications your baby might need. • Your child could get cranky, so do your best to keep a routine to go with the flow. • Be prepared to entertain your baby with music or singing. 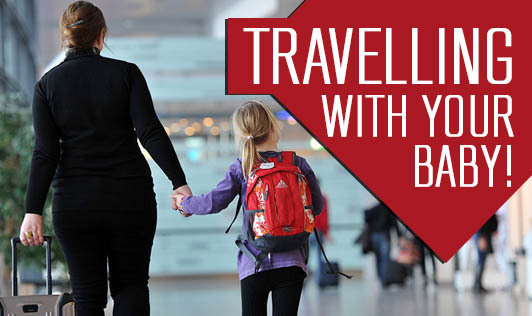 • If you are travelling alone with your baby, don't hesitate to ask for help or assistance. • Avoid travelling with your baby if they are less than 2 weeks old. Get your doctor's opinion if you have any doubts about a journey with your kid.